Johnson & Johnson's pharmaceutical division continues to reinvigorate its growth profile. NEW BRUNSWICK, N.J. ( TheStreet) -- Johnson & Johnson's ( JNJ - Get Report) earnings beat came as its pharmaceutical division continued to reinvigorate its growth profile. "J&J's stock had been dead in the water because its fundamentals were suffering," Jeff Bagley, portfolio manager at Haverford Investments told TheStreet, but over the last four months success in its pharmaceutical division has "clearly been where the upside is." In its recent quarter, J&J's pharma division saw sales increase by 12.3% to $6.23 billion. J&J pharmaceutical unit competes with other major drugmakers such as Pfizer ( PFE - Get Report), Merck ( MRK - Get Report) and Novartis ( NVS - Get Report). J&J received approval for three new drugs in recent months. 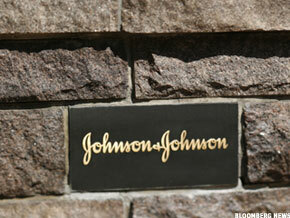 J&J received marketing approval in the U.S. for a prostate cancer pill called Zytiga in April. The company was then granted approval for Edurant, a once-a-day HIV pill, in May, and for Xarelto, a drug used to prevent blood clots after knee and hip replacement surgeries, on July 1. Generic drugs have dragged on J&J's pharmaceuticals business in recent years, and the company, which also makes Band-Aids, replacement joints and birth control pills, among other things, hopes to gain approval for around 10 new drugs by 2015, including medicines used to treat Alzheimer's disease, diabetes and arthritis. J&J's latest earnings also benefited from a lower-than-expected tax rate, Haverford's Bagley pointed out, which he estimated added around 4 cents per share to quarterly earnings. Despite the beat, J&J reaffirmed its 2011 guidance, saying instead it would reinvest any tax savings into its new product launches and R&D pipeline. >>For upcoming earnings and estimates, see our Earnings Calendar. "J&J is striking while the pharma iron is hot," Bagley said. "That's where they're enjoying a lot of success." J&J also saw sales gains in its other two divisions, medical devices and consumer products, the latter of which suffered a series of embarrassing product recalls for popular medicines like Tylenol, Motrin and Rolaids. J&J medical devices unit, where it competed with Abbott Laboratories ( ABT - Get Report) in the stent market before closing down those operations, and still competes with orthopedic replacement makers Stryker ( SYK - Get Report) and Zimmer ( ZMH, saw a sales increase of 7.2% to $6.57 billion. Because of its wide range of diversification within the health care, biotechnology and drug sectors, J&J is widely considered an industry bellwether. J&J's stock was lower by 0.5% at $66. 73 in afternoon trading Tuesday despite the earnings beat, likely because of it stood pat on its earnings outlook. In the recent quarter, J&J booked a profit of $2.78 billion, or $1 per share, compared with year-earlier earnings of $3.45 billion, or $1.23 per share. Excluding one-time costs, J&J's profit came in at $3.55 billion, or $1.28 per share. On that basis, results topped analysts' consensus call for a profit of $3.44 billion, or $1.24 a share in the June-ended period. Analysts typically exclude one-time items when forecasting estimates. Revenue rose 8.3% to $16.6 billion, from $15.33 billion. The line item also came in higher than the $16.23 billion Wall Street expected.